Renown Brazilian streetartist Kobra painted a mural in collaboration with HG Contemporary gallery above the landmark restaurant Empire Diner on 22nd and Tenth Ave in Chelsea. 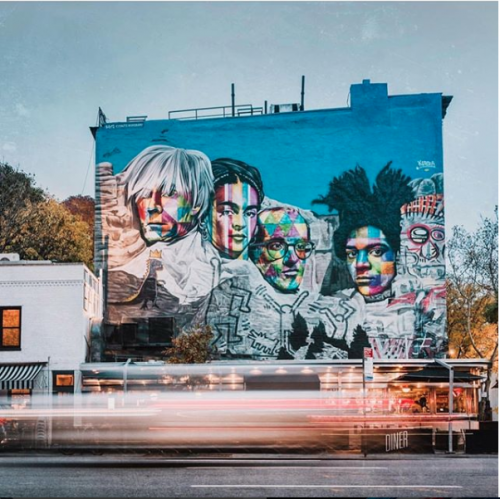 Visible from the Highline, the wall depicts four iconic and revolutionary artists Andy Warhol, Frida Khalo, Keith Haring, and Jean-Michel Basquiat as a depiction of Mount Rushmore. Owner Philippe Hoerle-Guggenheim comments that this mural is bringing art closer to the community and this works engages the viewer and draws an audience, as it should. Kobra painted 18 murals all around the city portraying themes of freedom, equality and peace. Below is a video of making of the Kobra mural. Brazilian streetartist Eduardo Kobra utilizes bright colors and bold lines while staying true to a kaleidoscope theme throughout his art. The technique of repeating squares and triangles allows him to bring to life the famous people he depicts in his images. This checkered pattern, filled with different textures, lines, and shading, builds up to Eduardo Kobra's final masterpiece, a larger than life mural for all to see and marvel at. Eduardo Kobra's ability to achieve photorealism while maintaining his playful, color theme is fantastic, making for a striking contrast against the setting it is placed in. Specifically, his cunning use of brushes, airbrush, and spray cans serve as a means of bringing to life notable figures from the past, emphasizing their true dignified nature and beauty. Eduardo Kobra has also utilized a darker color palette in some of his works while maintaining that stunning air of beauty in throughout his work. You can't help but feel a sense of nostalgia while looking at his creations, taking you back to a time when those individuals existed. The ability to recreate art that taps into individuals and eras past is a truly gift given to Kobra that is purely remarkable. HG Contemporary is a breakthrough gallery founded by Philippe Hoerle-Guggenheim in 2014. The gallery has built a reputation for unearthing distinct artists and producing shows that embrace groundbreaking aesthetics and concepts. The gallery is committed to developing an international contemporary program that is ambitious as well as diverse. The gallery's locations include Chelsea New York, Williamsburg, Napa Valley, and Madrid. This commitment carries with it an innovative and clear vision about producing exceptional art exhibitions as well as a deep understanding of visual culture's function within and beyond the walls of the gallery. This approach includes a digital path, which is under way. HG Contemporary has produced exhibitions featuring: RETNA, Tim Bengel, Stuart McAlpine Miller, Jason Dussault, Massimo Agostinelli, Olga Tobreluts among many others.